Founded in 1996, FuneralNet is the largest provider of custom designed deathcare websites in the United States, also serving clients in Canada, Australia and Puerto Rico. To this day, FuneralNet websites consistently rank at the top of search engines and resonate with our clients' target demographics. This drives increased shopper calls and online conversions. In 1997 FuneralNet invented online obituaries and forever changed the face of "deathcare." Our subsequent inventions of "online cremation arrangements" and "online ID of remains" began a second 'online deathcare revolution' of sorts in the U.S., to the tune of over $1M/year in online sales for some cremation businesses. 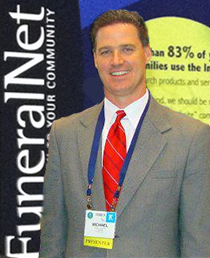 In 2008 FuneralNet was first to market with mobile websites. Most recently in 2013, when many in the deathcare industry were finally becoming aware of mobile websites, FuneralNet achieved another first as we started offering custom responsive websites – meaning one website rearranges its display to work on any screen size. We also began offering "fixed layout" websites to afford the programming and SEO prowess FuneralNet is known for, but at a lower cost. In 2010 FuneralNet began formally compiling a first-of-it's-kind database of "deathcare website behavior metrics." This has provided critical insights to how families shop and interact with funeral homes online. Unlike companies that specialize in template websites, FuneralNet's portfolio is made up of 98% custom designs that are unique to the firms the website is an extension of. This means we have analyzed how shoppers behave on different websites with different website offerings in similar markets. Then within our W.I.S.E. program, with it's first of its kind "Peer-to-Peer Comparison" reports, we've leveraged this data to specifically advise our clients regarding online strategy moves that make sense for them, monitoring performance after the changes are implemented. These are real data-backed suggestions – not just hunches from 10 or 15 years of experience, though we've been around since 1996. Because in the internet industry where the web and web behavior reinvents itself about every four years, it takes real data to know whether what worked well in the past is still relevant or changing fast. Besides our history of continual innovation and fact-based consulting, we are Google Certified with a track record of search engine marketing success. Our consultative staff hold Bachelor's Degrees in Business, Marketing, Public Relations, and Management Science with concentration in financial statistics. That means we know a lot more than how to build good looking websites that resonate with consumers. We help you "drive it" in the way that builds market share and profitability. For these reasons and more, FuneralNet remains the consummate deathcare website professional of the U.S. funeral industry. Give us a call today and together we can explore how we can help you achieve your online marketing goals.